Born November 19, 1917, Indira Gandhi the infamous third Prime Minister of India was a woman with a lifelong career of controversial politics. She ordered the June 1984 Operation Blue Star invasion of the Darbar Harmandir Sahib in Amritsar, India, popularly known as the Golden Temple. Thousands of innocent worshipers lost their lives in a premeditated massacre when troupes and tanks invaded and holiest of Sikh shrines on the 387th commemoration anniversary of the martyrdom of Fifth Guru Arjun Dev. The despicable act of Sikh genocide ultimately resulted in her assassination on October 31, 1984. 1947 - 1964: Held office acting as Chief of Staff during the administration of her father Prime minister Jawaharlal Nehru (Gandhi). 1955 - 1977: Central party member of the Indian National Congress. 1959: - Declined position of Prime Minister choosing rather the role of Congress President. 1966: Accepted position as Prime Minister of India. 1971: Pakistani Civil war treaty with East Pakistan and Soviet Union arms agreement during Nixon era and US support of West Pakistan. Indira wins the second term in Congress. June 12, 1975: Election voided on grounds of electoral malpractice, convicted of the dishonest election, refuses to resign. June 26, 1975 - March 21, 1977: the Ordered arrest of opposition and moved to rule by decree after a declared state of emergency by President Fakhruddin Ali Ahmed according to Article 352 Constitution of India which suspended all civil liberties and elections. 1977 - 1979: Removal from parliament following arrest ordered by Home Minister Charan Singh on charges that Indira planned to kill all the leaders of the opposition who had jailed during the emergency. 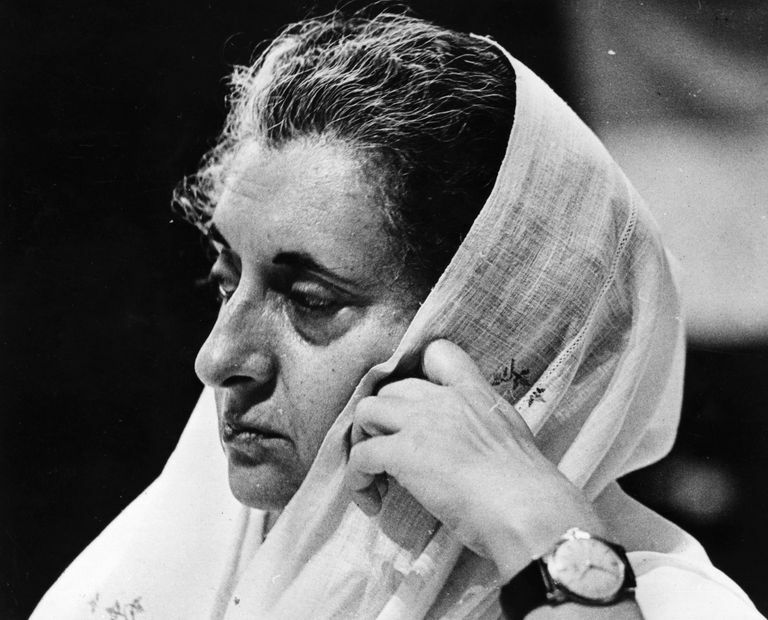 Lengthy trial results ultimately in Indira's reinstatement to the office and subsequent dissolution of parliament. 1977: Akali Dal party gains political power in Punjab. Backed by Congress Indira Gandhi fosters Sant Jarnail Singh Bhindranwale of Damdami Taksal in an effort to break the power of Akali Dal. The eruption of violence between political-religious factions results in the arrest of Bhindranwale for instigating murder of Congressman Jagat Narain. July: Bhindranwale rejects Congress, reconciles with Akali Dal and campaigns for an autonomous Punjab. A minority of militant separatist Sikhs attract some of Bhindrawale's followers who press for an independent state of Khalistan. August: Sant Jarnail Singh Bhindranwale forms an alliance with Akali leader Sant Harchand Singh Longowal to conduct a common campaign forming the Dharam Yudh Morcha anti-government agitation. 1983: Bhindranwale sets up headquarters in Darbar Harmandir Sahib, the Golden Temple of Amritsar, India and foremost spiritual and secular shrine of Sikhism, where militants begin stockpiling weapons. June 1984: Failed negotiations prompt Indira Gandhi to issue orders commanding her military force to invade the Golden Temple and Akal Takhat with troupes and tanks at a time when the complex is overflowing with innocent unsuspecting devotees on pilgrimage. The resulting devastation, while in pursuit and murder of Jarnail Singh Bhindranwale and his militants, includes the desecration of holy scriptures, defacing of the gurdwara and sacred Sarovar, destruction of The Akal Takhat, and ruthless slaughter of thousands of innocent worshipers. Punjab media is put on complete blackout with an official death count of Sikh civilians including men, women, and children vastly downplayed and under-reported. October 30, 1984: Indira Gandhi delivers a public speech at the public parade ground of the Orrisa Secretariat, stating that while she lives today, tomorrow may be her last, but that she should continue to serve until her last breath, and that upon death, her blood would strengthen and unite India. October 31, 1984: Indira Gandhi is assassinated by bodyguards Satwant Singh and Beant Singh while walking in her garden at her residence in New Delhi. Satwant and Beant surrender their weapons, are arrested, and detained in a location where Beat Singh is shot and killed. Riots and mayhem breakout in a horrific backlash against innocent Sikhs amounting to massacre and genocide. November 3, 1984: The cremation ceremony of Indira Gandhi is televised throughout India and abroad, spurning a violent wave of devastation and destruction which according to official death tolls takes the lives of 3,000 Sikhs and displaces millions more.